WHO doesn't love the end of the financial year. It means you can file your tax return to get an influx of money that you can spend at your leisure. While most people already know what they want to spend their tax money on, if you're short of ideas here are five gadgets that promise to make your life better without breaking the bank. Samsung has developed a reputation for quality household appliances and it's innovative vacuum cleaners are no exception. The Powerstick Pro is the company's latest answer to Dyson's hugely popular stick vacuum range and it doesn't dissapoint. Driven by Samsung's Digital Inverter Motor, the Powerstick Pro delivers up to 150W of suction power which does such a good job at collecting dust, dirt and hair from various floor surfaces, you will be forced to reconsider your definition of clean. The fantastic cleaning properties of stick vacuums usually come at the cost of battery, which is something Samsung has addressed with this model. The Powerstick Pro runs on a 32.4V lithium-ion removable power pack that offers an impressive 40 minutes of battery life - additional batteries can also be purchased if you don't want to wait to finish the cleaning. Built with convenience in mind, the Powerstick Pro's handle folds back to 50 degrees so you can reach awkward areas like under the bed or couch without having to strain your wrists or back. Those with allergies can also rejoice, with Samsung promising 99.9 per cent of the dust collected will stay in the canister thanks to high-efficiency particulate air filtration. 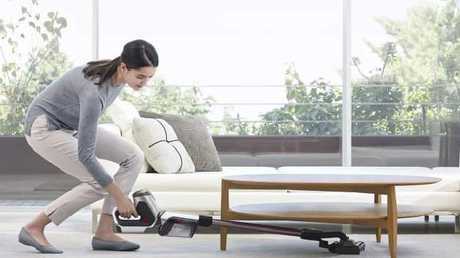 While the Powerstick Pro might be on the more expensive side of vacuum cleaners, the hugely impressive cleaning power and flexibility make it the perfect addition to your home. D-Link’s Covr Wi-Fi system will improve your coverage and speed. If you're looking for an affordable solution to fix Wi-Fi dead spots that receive no signal in your home, D-Link's Covr mesh Wi-Fi system is the product for you. The product includes three base stations powered by USB-C connectors, which are placed around your home to act as Wi-Fi hot spots to ultimately create a mesh network. 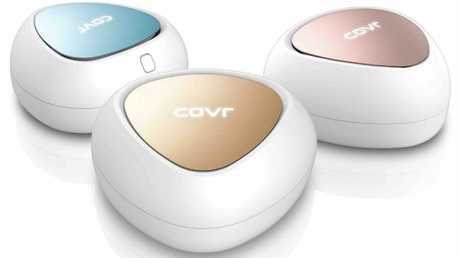 Covr units come pre-paired and are easily to set up using an Android or iOS app, with the system's Wi-Fi protected set-up button creating an instant connection to new devices without the need to enter new settings or passwords. Each of the three units also have two on-board gigabit ethernet ports which help free up wireless bandwidth for people using gaming consoles or smart TVs. The three hot spots are also capable of supplying Wi-Fi access to up to 465sq m, with speeds up to 1200Mbps. - during testing I found an improvement of 20-30Mbps in parts of my home where I used to get little or no connection. The product also uses technology to scan the wireless signal strength and automatically connect your devices to the strongest available signal, meaning you walk from room to room without experiencing a drop in quality. Additionally, Covr uses multiple user, multiple input, multiple output (MU-MIMO) technology which efficiently handles traffic to multiple devices and multiple streams at the same time. 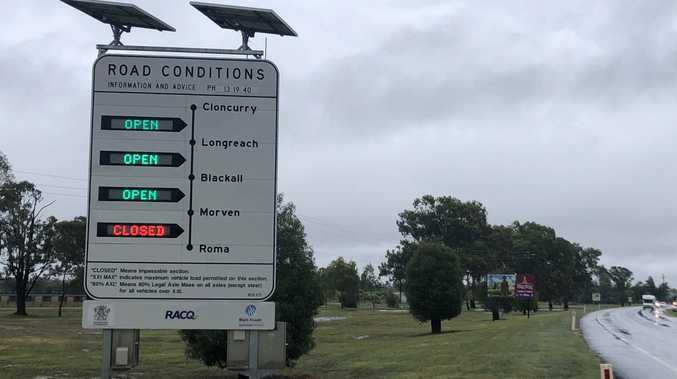 The product is very discreet for the most part, although the bold "Covr" branding on the top of each base station which illumuiates in the dark is a bit of a let down. And for parents, the accompanying app allows you to find out what devices are connected to Covr and offers the ability create schedules for when these can and can't be used. The sub can go horizontal or vertical depending on your needs. If you're someone like me who loves to watch movies in bed, you might also think you are selling yourself short by using the speakers from built-in to your TV. 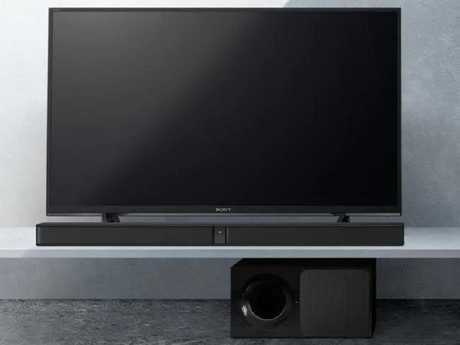 But no one wants to spend thousands of dollars on an expensive theatre system that will be overkill for the small space, which is why Sony's HT-CT290 bluetooth soundbar is so good. The 2.1 channel sound system has a powerful 300W total output and offers a cinematic listening experience from a slim soundbar and versatile two-way subwoofer. Both the soundbar and subwoofer feature an black body combined with dark mesh, which work together to deliver a clean and refined looking unit that appears more premium than its $399 price tag. Measuring 90x5.2x8.6cm, the soundbar can easily be placed in front your TV without it obscuring your view, plus there is the option to wall-mount. The 17x34.2x36.2cm subwoofer is a little more challenging to disguise, although the two-way design means it can be positioned vertically or horizontally. All of the inputs - optical, HDMI and USB - are hidden on the rear the device, with the unit also offering Bluetooth wireless streaming. Sony said its offering comes with "S-Force PRO Front Surround" which uses virtual surround sound technology to emulate cinema-style audio. While it's not going to be able to match a Dolby Atmos offering or even traditional 5.1 channel surround sound system, the unit is more than sufficient for your bedroom. At each end of the soundbar are drivers, which deliver a clear mid and High Range, while the wireless subwoofer brings decent lows. 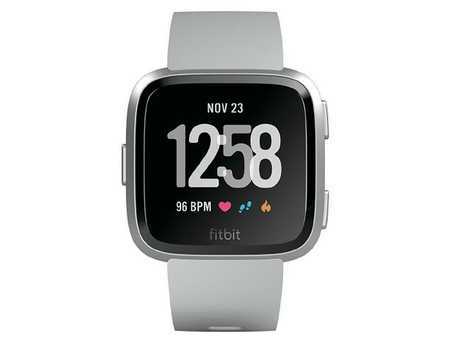 The Fitbit Versa looks very similar to the Apple Watch. While it's only available in a single size, the default case and silicone strap has three different combinations including a black aluminium case and strap, a rose gold case with a peach strap, and a silver case with grey strap - you can also purchase other bands for an additional cost. 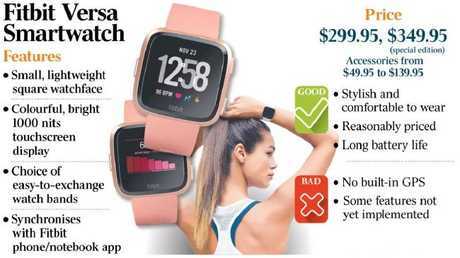 Fitbit Versa smartwatch pros and cons. If you're buying a Fitbit, chances are you're not using just for its ability to tell you the time. And given it's waterproof up to 50 metres, you can also record swimming. If you need extra motivation, you can set personalised reminders to ensure you to stay active and hydrated or stick to a sleep schedule - the Fitbit also provides information on how you sleep. It's worth noting the coach will only offer a few free sample workouts, with users wanting more personalised workouts having to pay for the service.